This is another personal piece. It's quite a large painting, but a lot of the details aren't visible, so I'll describe it. The title of the painting is Mathew's Story. 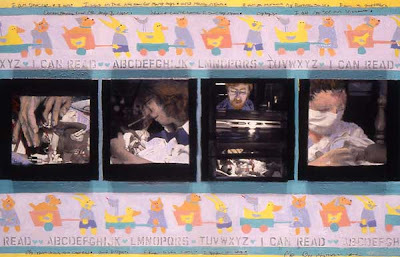 There are four image transfers of Mathew in the NICU as a preemie, from photographs by James Cowlin. I tinted over them. These images are on canvas, which is attached to a wood panel. See the shadows cast under the black – that's because the canvases stick out. When Mathew finally came home from the hospital, we had his nursery all set up, including a wallpaper border, which I painted on the top and bottom of the panel. At the very top and very bottom is a poem written by Mat. I know, you can barely see it, but it's in his handwriting, which I transferred to the panel. I am special • I am • I was in the hospital for many days • and many nights. I am a miracle my parents said. I am a survivor. Doctors pouring over me day and night • When I came home I saw my room • My toys • I did not see an incubator. My room was so colorful • and bright • I knew it was home • I knew it was. By the way, Mathew is now 19 years old, and a freshman at Kenyon College in Ohio and doing very well. We are so very proud of him.